Arthur: Do you know what I’m going to do? Arthur: I’m going to take a bath. Hobson: I’ll alert the media. Arthur: [rises] Do you want to run my bath for me? Hobson: That’s what I live for. Well how about the media alerting you to great deals available on products that you are interested in purchasing. Now that would be cool. Well it is here now. Digital Folio is a web-wide shopping application that functions as a browser add-on for Firefox and Internet Explorer; it also has mobile and Facebook versions. The application appears as a sidebar within the browser and lets shoppers make shopping lists by simply dragging a product’s link into the sidebar. 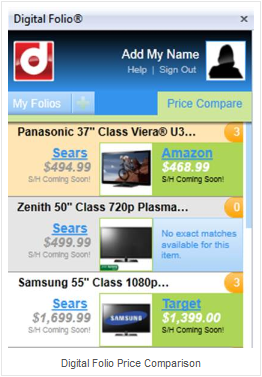 These shopping lists have real time price updates which can be tracked while shopping. Previous postGet the Best Price on Groceries!